Some months ago, I saw a picture of a variegated Haworthia limifolia, and knew that I just had to have one. 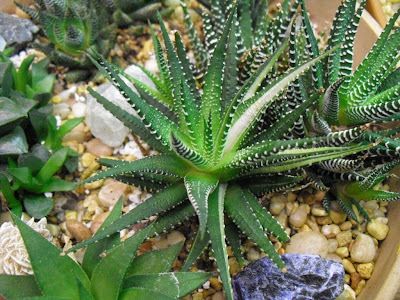 The regular green H. limifolia is probably my favorite Haworthia anyway, and variegation just seemed like icing on the cake. So I started looking. Nothing was available locally. None of my usual mail-order sources seemed to have any. And while there were plants available on eBay, either they had been bid up to a level beyond which I felt comfortable, or they were too small for the price + shipping, or they were from overseas sellers. I am not comfortable with buying plants from private sellers located outside of the United States at this time. I want to be as sure as I can that all customs and conservation regulations are being complied with. It is the least I can do to help protect the environment and natural habitats, both here and abroad. But just recently, I found a nice-sized plant from an eBay seller in California that wasn't overpriced or the subject of a bidding war. The variegation isn't as bold as many I've seen, but it is still pretty nice. And then just the other day, when I was rearranging my plants to accommodate those that had been brought in from outdoors, I noticed something. One of the Haworthia fasciata plants that I had bought a few years back, probably from Home Depot of all places, had grown a variegated offset. 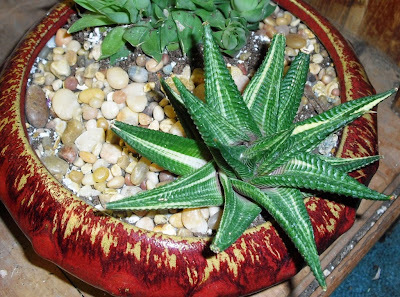 Haworthia fasciata, with four white-striped leaves. So I'm going to be keeping an eye on all of my Haworthia plants, to see if anymore have surprises in store for me. That so rocks. I hope it gives you lots of offsets. Thanks, Thomas, I hope so too. So far, all my Haworthia plants have been eager offsetters, so I have lots of chances for surprises. How awesome that you have a variegated offset! It is a beauty!